It feels like forever since I just sat and wrote. You know that soul searching, deep, meaningful writing that just stirs the heart and pulls at strings. The free unstructured stuff that just flows and flows. Which is ironic really, as it appears as if I may have just managed, to almost grasp this whole posting regular concept. Naturally this is a wonderful thing. Only the writing that has been coming out has not been the stuff that I want to write. I mean on some levels it has been. It's not like what I am writing has been untrue or not meant but it was stuff I made myself write just so I was writing. Just so I had something to post in the hope it might attract a few more readers. For as much as I dearly long to be a famous author, making the time to write is sometimes easier said than done. Finding the time when the ideas and words are ready to flow is of course another thing altogether. Right now though I really am just trying to concentrate on writing...(she says as she drifts off to Klout to check out her popularity status there) No really. I just need to keep on writing. Thankfully though I do feel I have a bit of a knack for entertaining so I am confident if I just keep plodding along all will fall into place. Every now and then and sometimes even more, I manage to come up with something that shows me I am still heading in the right direction. I just need to remember to keep on going. There are just so many distractions though remaining focused sometimes takes more dedication than I can find. Perhaps in the not to distant future I will make that matter? I couldn't help but get a giggle out of it. That sums me up to a tee. Or at least the old me. The new and slightly improved me that is currently in the process of developing, will not be a procrastinator. She will be a decisive go-getter that writes awesome books that people the world over want to read. That way Hubs, the kids and I can go and travel this wide brown land and come up with even more amazing things to write about. Everyone's gotta dream right? Well that's mine. In the meantime I will just keep on flogging my blogging because just between me and you, I know the best is yet to come. I can just feel it. I am like a good wine, I just keep getting better with age. I so get the procrastination thing! Lately I've had lots of blocks to writing - mental and time. But just have to keep on pushing through, right? Oh yay you have normal commenting back so i can comment again. That should give you a bit more instant gratification. Hang in there mate. Take it slowly and it will come to you ! Lately I've had so many ideas but not enough time to write about them. I just keep adding them to a list, because I figure one day the ideas will run out and I'll be needing them! Ah, sometimes I wish we could go out for a coffee together, you and me! I can relate to this post 100%... Although, I'm always a bit surprised by what people get all excited about and comment on and what people completely ignore! You know - just between you and me, and the rest of the internet - I can actually see myself on television promoting my book... If only I could get a sneak peak inside the cover so I had some clue as to what to write! Hey there, I for one,relate 100% to what you're saying. Blogging is like a lover you know you should get rid of...addictive, insidious and all consuming. Especially when you get into the social networking aspect of it all. I find there are days that it is hopelessly daunting to me, a girl who really only blogs because I love to write. 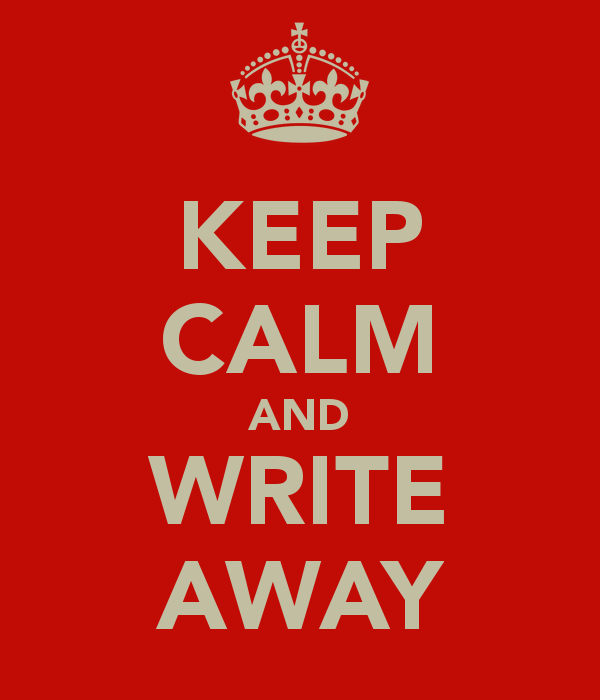 A writer friend of mine suggests mixing it up - blog one day, work on your novel the next. I have hauled out my first draft from the dusty recesses of my wardrobe and am going to give that a bash. Good luck with it! 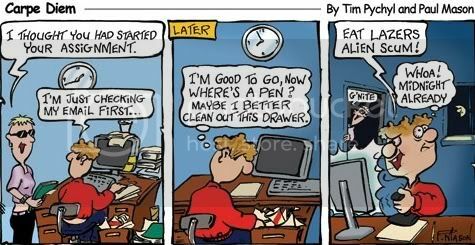 LOVE that procrastination sign :) I'm a sufferer of it from way back but this week I began to shift gears. Just had a fear time was running out so I'd better start making the effort to carve out spaces in my life to write. I just know though something will have to give, and if it has to be my blog than so be it. My novel has been whispering to me for years and its what I want most. I hope you too get the chance to get yours out there as well! Well you definitely struck a chord with this post! Thanks Katrice, it has a nice ring to it doesn't it?